Glad to see you, I haven't blogged in sooooooo long it's terrible really. I'm not the most computer savvy person out there so my blog doesn't change a lot but I do love to put my creations up to share. I am super pumped up to be applying for a position on the Aurora Wings design team. I only just seen that there was an opening for a DT on Thursday and today it closes. But I managed to get a creation made so that I could apply, I have been buying these digital stamps for a long time.....and I completely fell in love with each and every one of them. I'm pretty sure that I have bought at least 3/4 of them if not more. I also follow along on Facebook, that's where I seen the DT opening. I love these stamps for the detail of some of them, yet the simplicity of others....like the Sprites. So now I would love to share my creation using an image called : Icy Snow Queen by Mitzi Sato-Wiuff. 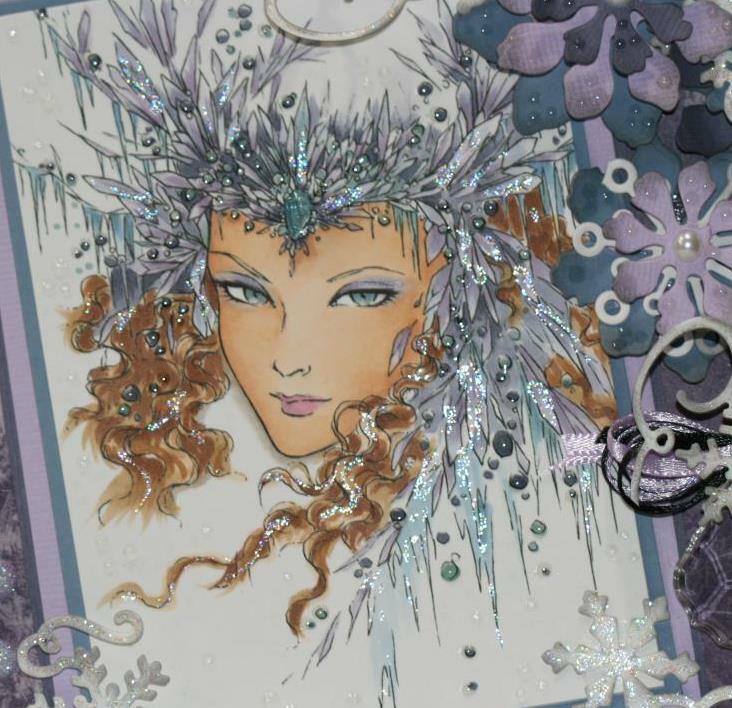 I colored her using copic markers, The paper is Bazzil cardstock, patterned paper is from Moxie winterland- Frozen. 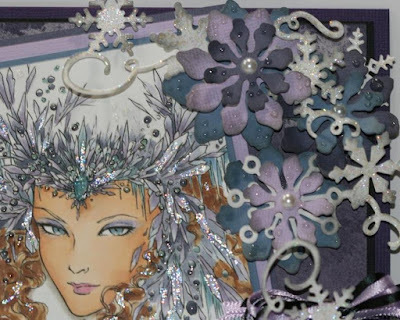 The die cuts used are snowflake border die and the flowers are Spellbinders -Heartfelt Creations called Tattered Blossoms. 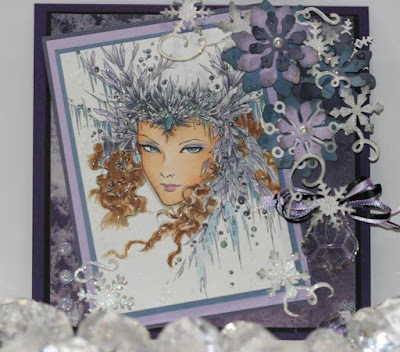 From Ranger I also used Stardust stickles, Glossy Accents and inked the edges of the flowers and image with Hickey Smoke ink. A closer look at the flowers that I made using the spellbinder die cut and also adding some dimension by popping them up with foam squares and adding little drops of Glossy Accents - like dew drops. I would be thrilled if I got choose to participate on the Aurora Wings Design Team . Good Luck to everyone who created and applied.